Bosko was very successful for Warner Bros.’ Looney Tunes series. He appeared in a total of 39 short films. Things seemed to be going great until 1933. Hugh Harman and Rudolf Ising negotiated with producer Leon Schlesinger for more money so that they could improve the quality of their cartoons, and make them in color. Schlesinger, who was notorious for wanting to spend as little money on the creation of cartoons as possible, refused their requests. Ultimately, the two men decided to leave. Since they owned the rights to Bosko, they took him with them. Having learned a lesson from their former boss Walt Disney losing the rights to use Oswald the Lucky Rabbit, they created Bosko in 1929 and copyrighted him so that in case they lost a job, they would not be screwed out the characters they created. Schlesinger had to start over. He convinced several animators from rival studios to come to him. One of them was Tom Palmer who created Buddy and directed the first two Buddy cartoons. However, the cartoons were so poorly received that Palmer was fired and Friz Freleng was hired to re-edit them into one. This resulted in the cartoon called Buddy’s Day Out. There was the need to create a new better character. Friz Freleng made the Merrie Melodies series cartoon I Haven’t Got a Hat in 1935 which introduced several new characters to hopefully be a replacement for Buddy for the Looney Tunes series. They included Porky Pig, most famously, and Beans the Cat, who became the new star of the Looney Tunes until he was supplanted by Porky. Before being dropped, Buddy appeared in a Merrie Melodies short called Mr. and Mrs. Is the Name which was directed by Friz Freleng. He and his girlfriend Cookie were depicted as merpeople, and this was his only appearance in a color short. However, the character’s names are never given, and therefore, some people dispute whether or not the characters truly are Buddy and Cookie. Buddy was never seen again until the 1950s when his cartoons began airing on television. He made a new apperance in the 1990s series, Animaniacs in the episode “The Warners’ 65th Anniversary Special.” Within the show’s fictional universe, the Warner siblings of Yakko, Wakko, and Dot were created to make Buddy’s cartoons more interesting. They consisted of the Warners constantly hitting Buddy over the head with mallets. Finally, Buddy was dismissed, and he became a nut farmer in Ojai, California. Buddy was furious at the Warners for ruining his career, and he plotted to destroy their anniversary special. Buddy also was seen on the show on PBS called History Detectives, in the form of animation cels. Warner Bros. was having some bad luck in creating a starring character for the Merrie Melodies series. The first two, Foxy and Piggy both were short-lived characters, appearing in only three and two short films, respectively. For a while, the Merrie Melodies consisted of one-shot characters, that is to say, characters that were created for one cartoon, and never used again. These cartoons were: Red-Headed Baby; Pagan Moon; Freddy the Freshman; and Crosby, Columbo and Vallee. A month after the latter-most cartoon, there was a short featuring a new starring character; it was called Goopy Geer. This short was about a tall, lanky humanoid dog, named Goopy Geer, who first played the piano, and who was very dedicated to it. 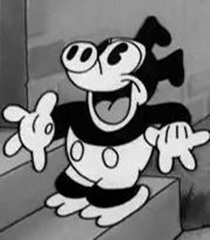 Goopy looks similar to the Disney character Goofy, who debuted shortly after in the Mickey Mouse cartoon, Mickey’s Revue, and whose original name was Dippy Dawg; because Goopy and Goofy debuted in the same year (1932), it is thought that the similarities between the two are coincidental, and that neither was a rip-off of the other. 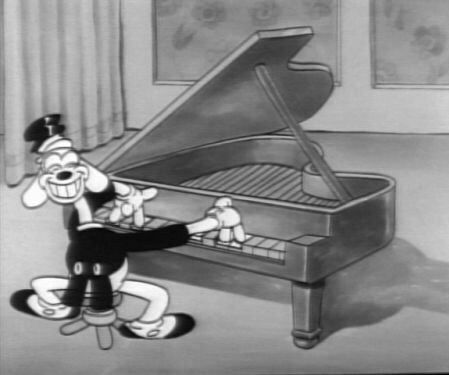 Promotional drawings depicted him as a black dog, but in all of his cartoon appearances, Goopy was white. Interestingly, his un-named girlfriend, a short dog, previously debuted in Freddy the Freshman. A month later, the short, It’s Got Me Again! was released; it was a one shot, and it featured mice who were never seen again. After that, Goopy appeared again in a short subject called Moonlight for Two. It seemed that Warner Bros. had a star character for the Merrie Melodies; however, Goopy made only one more appearance in The Queen Was in the Parlor, and he was dropped. He later made a brief cameo in the Bosko Looney Tunes short, Bosko in Dutch. Following that, the Merrie Melodies series focused on one-shot characters until the late 1930s. 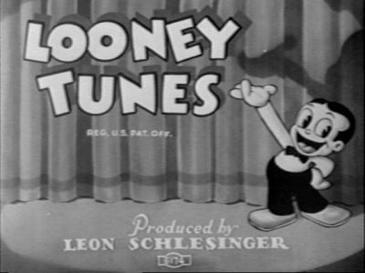 Goopy made one last screen appearance, around sixty years later, when he appeared in the Tiny Toon Adventures episode, “Two-Tone Town”. He is redesigned as a black dog, in line with how he appeared in original promotional drawings. 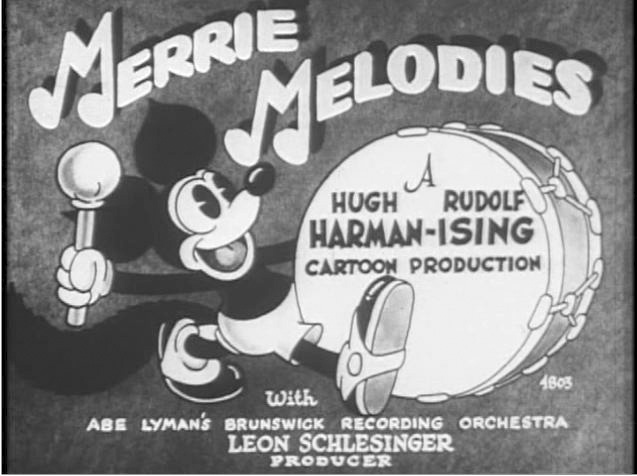 After Foxy, the previous starring character of the Merrie Melodies was dropped, a replacement debuted just a month after Foxy’s last appearance in a theatrical cartoon short subject. He was Piggy. Piggy debuted in a short called You Don’t Know What You’re Doin’!, where he played the saxophone in a night club. Piggy looked a lot like Mickey Mouse, only as a pig. He still looked less like Mickey mouse than Foxy did, but even then it is likely that there was no intention to copy Mickey Mouse because because Mickey, Piggy, and Foxy were based on sketches of mice that Hugh Harman drew in 1925, while Harman was working for Disney. Piggy appeared in one additional short in the series called Hittin’ the Trail for Hallelujah Land, which was later banned from TV and home media, due to containing portrayals of black people that are now considered offensive; it was one of eleven shorts that are called the Censored Eleven, and I will discuss them in a future post. Then he was discontinued. Friz Freleng revived the character in 1936 under a brand new design. 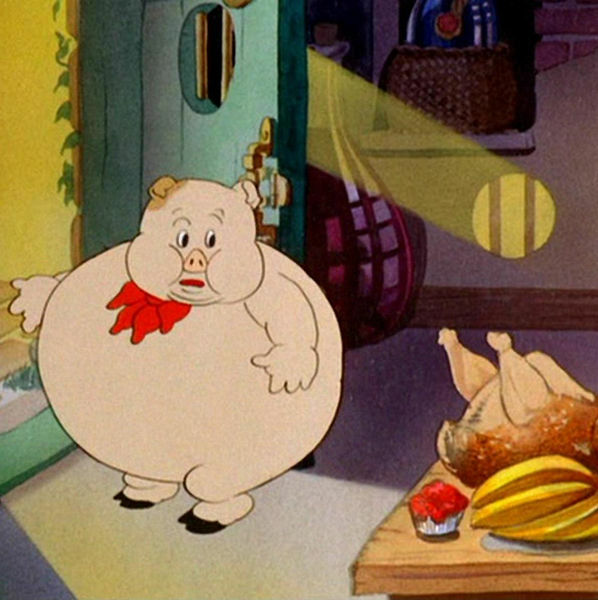 Piggy appeared in two cartoons, At Your Service Madame and Pigs Is Pigs; the first depicted him as the part of a family, and the latter featured him the main protagonist; both portrayed him as a glutton as is defining character trait. Piggy did not appear in the Tiny Toon Adventures episode, “Two-Tone Town”. When Warner Bros. created the Merrie Melodies series, they needed a character to be the star. 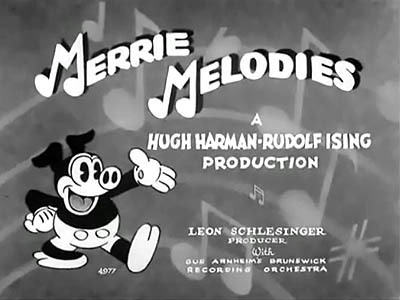 Rudolf Ising assumed supervision of the new series, while Hugh Harman began directing Looney Tunes shorts as a solo director. Ising created Foxy, who looked very familiar. As you can see, Foxy looked almost like Mickey Mouse. The biggest differences are the ears and the tail. It may appear that Foxy was a rip-off of Mickey Mouse, but that is not true. In 1925, Hugh Harman, who was working for Walt Disney at the time, along with Ising drew some mice. These mice were later used by Disney and Ub Iwerks to create Mickey Mouse. Harman figured that since he made the original drawings, it was perfectly acceptable for him and Ising to create a character based upon them. And so, Foxy was born. Foxy debuted in 1931 in the short, Lady Play Your Mandolin. He would appear in two more shorts, Smile, Darn Ya, Smile! and One More Time, before being retired; in fact, he was killed off in his last short. Foxy would be brought back to life in 1990s in the show Tiny Toons Adventures, where he and his previously unnamed girlfriend, who is now called Roxy, are, along with another largely forgotten early Warner Bros. cartoon character, Goopy Geer (whom I will talk about in a future post) live in the black-and-white part of Acme Acres. They have been long forgotten over many decades, and so, Babs Bunny and Buster Bunny decide to give them another taste of the spotlight. Foxy has lived on in home media releases and even on television. In 2000, Cartoon Network aired a special hour-long episode of their documentary series ToonHeads called The Lost Cartoons, which featured pieces of Warner Bros. animation that either had been rarely seen, if at all, since their original releases, or had never been seen by the public at all. This special featured Lady, Play Your Mandolin! and it was later released on the first volume of the Looney Tunes Golden Collection. I originally wrote this for my Communication Research class, this past semester. The purpose of this content analysis is to analyze the Disney Princess characters based on how well they are as media depictions of women. In other words, the characters will be analyzed based on how they fit in or do not fit into to traditional gender roles; how they subvert and/or maintain traditionally female expectation; and how feminist they are portrayed. The Disney Princesses are among the most well known animated characters of all time. Many girls have looked up to them. They can be seen everywhere from, of course, the movies, and various forms of merchandise such as clothing, Halloween costumes, dolls, candy, and anything that one could possibly think of. It’s clear that these characters are a gold mine for The Walt Disney Company. However, not everyone is keen on the Disney Princesses. Countless individuals have criticized the franchise, accusing Disney of doing things such as stereotyping girls, telling girls that being princesses is the only thing that they can do and/or should strive for, and of the movies themselves, being negative and anti-feminist portrayals of women that serve to reinforce patriarchal and traditional expectations of women. This content analysis will analyze six of the official Disney Princesses: Snow White from Snow White and the Seven Dwarfs; Cinderella from Cinderella; Aurora from Sleeping Beauty; Ariel from The Little Mermaid; Belle from Beauty and the Beast; and Jasmine from Aladdin. I will analyze them based on what their goals are (that is to say, whether they have goals that conform to traditional expectations of women and girls or not); and how assertive they are (in other words, the question of whether or not they stand up for themselves when they are able to, and if they take the initiative to reach their own goals, or if they do nothing while others simply do stuff for them). In addition, I will quantify the number of times that they engage in assertive declarations and actions; I will define assertive declarations and actions as any instance where the Disney Princesses, through words and/or actions, stands up for one’s self and/or others. The purpose of mentioning the goals of the Disney Princesses is to address a common criticism of the franchise. Several of the characters have been accused of having goals and dreams that are nothing more than wanting a man to be with. Such critics charge that the movies send the message that the only thing a woman should aspire to is to find her one true love. In this paper, I will examine whether the Disney Princesses only care about romance, or if they care about more than simply romance. To begin with, I will start with the very first Disney Princess: Snow White from Snow White and the Seven Dwarfs. Personality wise, Snow White is portrayed, above all, as a kind and sweet-hearted individual. At the beginning of the film, she is cleaning the outside steps of the castle, while wearing rags, as her evil stepmother, the Queen, has forced her to do as a result of the Queen’s jealousy of Snow White’s beauty. I have counted only one assertive declaration and/or action that Snow White engages in. The only assertive thing she does is running away when the Hunstman informs her that the Queen wants her dead. The rest of the film, Snow White expresses her dreams, wishes, and hopes, which seem to be nothing more than her true love one day finding her, and carrying her off into the distance where they will be happy together for the rest of their lives. Next is the title character of Cinderella. I have counted three assertive declarations and actions that she engages in. Cinderella is a multi-faceted young woman. She is a gentle and kind person, as exemplified by the fact that she has befriended several of the birds and mice who live in the large chateau she lives in; mice are often viewed as pests, but since she is treated horribly by her step-family, she can clearly empathize with people and even animals who would likely be mistreated as well. Moving on, Cinderella is a strong and assertive woman and human being, but only as much as she can be. Even though her family abuses her and treats her as servant, Cinderella remains optimistic, and does not allow the abuse she has suffered to make her into a bad person. She almost always maintains a positive attitude. At times, Cinderella does get frustrated; she complains about the sound of the morning bell of the clock of the palace, and at one point she says, “Oh now what do they want?” when her stepsisters yell to her to do some sort of task for them. Cinderella is assertive, as said previously, only to the extent that she can be. When the palace sends out a decree that “every eligible maiden” (which I assume means, any young woman who is of marriageable age, and who is not already married or engaged to be married) is to attend a ball in honor of the Prince, to help him find a woman to marry, Cinderella points out that she can go as well. Her stepsisters, Anastasia and Drizella, mock such a notion, that the Prince would be interested in a girl who is a servant. Cinderella, however, stands up for herself, stating that regardless of how they treat her, she is still a member of the family, and the royal decree never said that servant girls are not to be counted as “every eligible maiden.” Her stepmother, Lady Tremaine, concedes that Cinderella is right, and gives Cinderella permission to go to the ball, but only on the conditions that Cinderella finishes all of her chores and finds a dress that is proper to wear to a ball. I would like to expand upon how Cinderella’s assertiveness only goes so far. While, Cinderella does defend her right to go to the ball, she does little else other than saving the mice around the chateau. Part of this has to do with the time period the movie is set in. A woman in those times likely would not have had many options for an independent life. One might say that Cinderella could run away, but then she would likely be homeless, or be forced to take a job as servant for another family, who might very well abuse her as well. Not to mention, if she ran away, her stepmother could potentially badmouth her to people who might otherwise be interested in considering her for employment. With regard to goals, Cinderella does not seem to live the principle of “The only thing a woman should want is a man.” What she really wants is freedom. Cinderella longs to be happy, and to be cherished and valued by somebody. Ultimately, of course, it is marriage that provides Cinderella with her ticket to the life she wants. Despite her successful attempts at being assertive and standing up for herself to her step-family, there are still many other times where she is powerless. Next is Aurora from Sleeping Beauty. It’s rather hard to analyze her, from a general standpoint, or from a feminist standpoint, because Aurora is very undeveloped as a character. In total I have counted zero assertive declarations and actions. She is depicted as being kind and beautiful, but that’s all that she is. She is a romantic at heart, and she is a big believer in how dreams are destined to come true. However, Aurora never does anything to make her dreams come true; she is passive rather than assertive. While picking berries in the forest, she tells her animal friends that she has met her true love multiple times in her dreams, but is convinced that she will meet him in real life because as she says, “If you dream a thing more than once, it’s sure to come true, and I’ve seen him so many times.” Moments later, Aurora does in fact the meet her dream lover, Prince Philip. They embrace each other, but when Aurora realizes that she must return home, she runs away, but invites Philip to her birthday celebration . When the three Good Fairies, Flora, Fauna, and Merryweather (who have raised her under the name of Briar Rose, and told her that they are her aunts), tell her that she is a princess and is betrothed to be married to Prince Philip (she is unaware that the young man she met is in fact Prince Philip, and he is unaware that she is Aurora; they never even learned each other’s names) she cries in devastation. Aurora does not stand for her right to marry whomever she wants, she goes along the the Good Fairies back to the castle. Shortly afterwards, Maleficent hypnotizes her into pricking her finger on a spinning wheel, leading to her going into a deep slumber that can only be awaken by receiving true love’s kiss. Yet, her passiveness ultimately leads to her getting all she desires: her one true love. It is interesting to note that given Aurora’s flatness as a character, the Good Fairies are more well-drawn and developed than she is. In fact, one can make the argument that they are the true main characters of the film. They could also be more easily defended on feminist grounds. First, they are not typical female characters. They are depicted as being old (though as supernatural beings, they are likely immortal and at least hundreds of years old), and they are not “conventionally attractive.” Flora, Fauna, and Merryweather are depicted appearance wise as short and overweight; Aurora, by contrast, is tall and thin. They all are assertive, and they take the initiative to protect Aurora. They conclude that the only way to keep Aurora safe from Maleficent is to raise her in seclusion. When this ultimately fails, however, they still do all they can to break the spell. They rescue Prince Philip, who had been captured by Maleficent when he came to their forest home to see Aurora. While Prince Philip does defeat Maleficent, he does so with their help; the Good Fairies give him a magical sword and shield. The Good Fairies are the active protagonists of the story, and they even participate in the “typically male” action of rescuing the damsel in distress. They secure the happy ending for Aurora and Philip. Moving ahead thirty years, is The Little Mermaid. It’s protagonist, Ariel, is very different from the previous three Disney Princesses. I have counted four assertive declarations and actions that she engages in. She is first and foremost, the type of girl who is curious about what lies beyond her own experiences. Ariel is obsessed with life on land, and to that end, she has collected countless items from sunken ships. This is important, because the movie shows that Ariel is assertive, and that she rebels against the narrow expectations that are imposed upon her. She knows that there is more than just the sea, and she longs to be apart life on land, to become human, and follow her heart’s yearning. She is the most assertive Disney Princess thus far. Her main goal in life is not to find a man, but to live a life that is completely different so that she can finally find happiness. Also, Ariel is noteworthy as the first Disney Princess to save the life of a man. When there is a huge storm, Prince Eric is thrown overboard his ship, and Ariel rescues him from drowning. She is immediately in love with him. Later on, when Ariel’s father, King Triton, finds out about her feelings for Eric, and he angrily expresses his disapproval. This leads two Flotsam and Jetsam, Ursula’s two pet eels, to lure Ariel away to Ursula’s lair so that Ursula can use Ariel to gain control of the kingdom from Triton. The scene where Ariel makes her deal with Ursula to become human is interesting in how women’s roles in society are discussed. Ursula demands Ariel’s voice as payment. Ursula tells Ariel that on land, men prefer it if women never speak. This is interesting to me because rather than depicting a protagonist behaving in an anti-feminist manner, they portray an antagonist as such. This specific portrayal seems to imply that it is in fact a bad thing for women to never speak their minds. Next is Belle from Beauty and the Beast. I have counted six assertive declarations and actions that she engages in throughout the film. She is perhaps the most complex Disney Princess thus far. Belle is an intellectual. She has a huge love for reading books and expanding her mind into new horizons. Because of this she is considered odd, as her society does not consider it suitable for a woman to be very educated, and therefore, Belle has no friends in her village. The lack of a human connection has made Belle into an independent women. Belle is not happy with her life, and the thing she wants most of all is to live a happy, adventurous, and fulfilling, and to have someone (not a romantic partner, necessarily, but SOMEONE) who can understand and respect who she is. This leads to some conflict with Gaston who wants to marry Belle, but she does not like him because he is arrogant, narcissistic, and does not consider women to be equal human beings like men. This is evidenced by Gaston stating outright that women should not read because then they would get ideas and such. Gaston also has no respect for Belle’s right to make her own choices. He attempts to marry her without her consent, having already set up a wedding and everything. He plans for her to be a traditional and submissive wife, but Belle firmly rejects him. Belle shows herself to be assertive in standing up to Gaston for her rights. After this, the horse Phillipe, returns without Belle’s father, Maurice. Belle rides him to the castle where Maurice is being prisoner by the Beast. Belle once again shows her assertiveness in offering to take Maurice’s place as the Beast’s prisoner. The film is often accused of romanticizing abusive relationships, and Belle is often accused of having Stockholm syndrome. I disagree with both of those notions. First of all, from the beginning, Belle is assertive towards the Beast whenever she is able to. When the Beast demands that she join him for dinner, she firmly states that she will not eat dinner with. Given how little respect he has for her, she wants nothing to do with the Beast. Belle also shows some rebelliousness, in fulfilling her thirst for knowledge. She goes to the West Wing of the Castle, despite the Beast telling her not to. When he catches her, he responds with explosive anger, seriously scaring Belle in the process. She immediately runs away into a pack of wolves. The Beast follows after Belle to save her, but this leads to him being injured. She takes him back to castle to treat his wounds, and when the Beast complains about how Belle caused the entire ordeal by running away, she counters that she would not have run away if she hadn’t scared her. He responds that she should have stayed out of the West Wing, and she responds that he needs to learn how control his anger. This leads to the Beast making significant changes in his life and in how treats Belle. He notices that Belle is sad, and she is still keeping her distance from him. He wants to do something for her, to make things better for her, and he introduces her to the castle’s library which contains more books than she had ever seen before in her entire; it is far larger than the bookshop in her village, certainly. This shows that he is cares about what she is interested in. Belle and the Beast begin spending more and more time together, with the Beast treating Belle with the utmost respect. This is proof that the film does not romanticize an abusive relationship. If anything, the film shows that people will respond favorably only to people who try to treat them with genuine respect. Also of note is the fact that the film does not depict Belle trying to change the Beast. She does not try to be nice to him so that he will not disrespect her, and she certainly does not cower in fear for the majority of the time before the Beast starts being kind to her. She stands up to him, and refuses to submit to his demands. In fact, the entire reason she is at the castle is by choice, in order to save her father. She willingly puts aside her suffering for the sake her father. The above shows that Belle has a lot of agency. Every action she takes in the film is her own choice. This combined with the fact that Belle rebels against certain traditionally female roles is clear proof that Belle is a highly feminist portrayal of women. Finally, I will discuss Jasmine from Aladdin. Jasmine is the first non-white Disney Princess, and she is from a culture that is known for being very oppressive towards women, namely the Arab/Islamic world. Jasmine’s conflict at the beginning of the film is how her father, the Sultan, is forcing her to get married. By law, all princesses must be married to a prince. Jasmine, however, does not like any of the princes that her father invites to the kingdom of Agrabah. She tells him that she wants to marry for love. Jasmine also laments about how she has very little agency. She expresses how being a princess is not always fun; she has never been outside the palace walls, and always has servants telling her what to do, with regard to performing her princess duties, I presume. Jasmine realizes that she has to take control of her own life. At night she runs away from the palace. The following day, Jasmine is incognito, wandering through the marketplace. She sees a young boy trying to reach an apple, and she gives it to him. However, the merchant, angry at her for stealing the apple tries to chop her hand off, Aladdin, who witnessed the ordeal quickly intervenes, saying that Jasmine is his sister who is crazy. Far from being a helpless damsel in distress, Jasmine is able to play along and act as though she is mentally ill.
Later on, Jasmine does more to show that she is assertive, she is able to use a stick to jump between the roof of two buildings, just as Aladdin has; “I’m a fast learner,” she says. When the guards capture Aladdin, she attempts to use her royal authority as a princess to tell them to stop, only to be told that Jafar is the one who ordered Aladdin’s arrest. Other assertive things Jasmine does throughout the rest of the film include, standing up to Jafar for having Aladdin arrested by the palace guards; admonishing her father, Jafar, and Aladdin (who is disguised as Prince Ali) about how they are demonstrating a complete lack for her rights to make her own choices about whom to marry and telling them, “I am not a prize to be won!”; calling out Aladdin for lying about being who he was; and helping to distract Jafar when Aladdin tries to sneak back in the castle. Jasmine engages in a total of eight assertive declarations or actions within the running time of the film. In conclusion I have analyzed how often several Disney Princesses engage in assertive behaviors. It is clear that as time moved on, the filmmakers recognized that women are capable and strong, and the films more and more began to reflect that. These pieces have a film connection with me. The first time I heard them was probably when I was a child, and I first saw a Warner Bros. cartoon called A Corny Concerto. It was a parody of Fantasia, and it featured Elmer Fudd introducing two pieces of music: Tales from Vienna Woods and The Blue Danube. The first segment featured Porky Pig and a a hunting dog, pursuing Bugs Bunny; the second focused on a young Daffy Duck being wanting to be accepted by a family of swans, but all of attempts fail. In addition both pieces inspired two separate MGM cartoons. This one is about deer interacting with the faun known as Pan. This one is a sweet fantasy taking place in the forest. And here are the pieces in their original contexts. Gender and Sexuality as portrayed in the Glee Episode "Feud"